Buy a copy, and start reading. Rene Denfeld is an internationally bestselling author, journalist, Mitigation Specialist, and fact Investigator in death penalty cases. She has written for The New York Times Magazine, The Oregonian, and the Philadelphia Inquirer and is a published author of four books including the international bestseller The New Victorians: A Young Woman’s Challenge to the Old Feminist Order, Kill The Body, The Head Will Fall, and All God’s Children: Inside the Dark and Violent World of Street Families. A book about life on death row should not be able to be described with words like “beautiful” and “haunting,” and yet, those are the two words that come to my mind when I think of this book. I read most of it in the course of one evening, much of that time spent soaking in the bath. 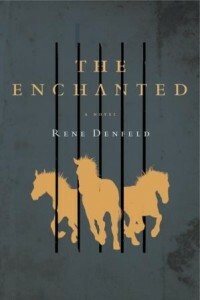 Needless to say, I was so entranced with author Rene Denfeld’s use of language that not only was I stopping to read bits of it aloud (I needed to TASTE the words), thus alarming my dogs, but the water had gone cold, and I had become a complete prune before I could tear myself away. The story itself is rather grim: a prisoner awaits execution, and uses books and his imagination to transcend the bars that imprison him. An investigator (the Lady) digs up as much information as she can in order to save the lifers, but the work is slowly eating away at her soul. A fallen priest offers whatever spiritual solace he can. While the Lady and the Fallen Priest do move toward, and into, a relationship, there is no way this can be described as a romance, nor is any of it terribly happy. What it is, then, is terribly, awfully, human. Poignant, visceral, naked humanity, wrapped in amazing language that drips from your tongue like the slow creep of river water down the prison’s stone walls. This review is part of a blog tour hosted by TLC Book Tours. For more information, visit the tour page for this book by clicking here.